Thought I would break the 7 memo/month barrier in may but slowed down at end. Lunch at G cafe: I miss Basils. After to ul for Fourier but have forgotten card :-( Back to bas for slide-show of season talk, then allot: weeding & enlargement. No gloves so can't do much. Can only prise D away from M'a's garden where he is playing with Sam, Charlie & Meg+J by tempting him with prospect of swim. But then at home he doesn't want to go out. Hmmf. Make bread which turns out well. Tidy up while D plays at washing up etc. Sit in l'room with coffee. D comes in, says 'I want a wee' & uses his potty: but then looks it over & tips it over floor. I should have sent him upstairs but he looks so sad. But later he gets sent up anyway for something trivial - spilling juice - & ends up falling asleep. He was tired: I should have seen that. M comes home early: good grief: actually using her free pm, or some of. Decide for fun on policy of taking ref photo of house at start of each month. Steps go on path to pond, back level with chestnut. Use niken on wide, use optic viewfinder with top level with roof. While out slugging see hedgehog. M+J arrive 11.30 but I'm still up, booted into linux for once, writing CLIMAT. Swim: record for aggregate 4x10: 26.5 (indiv record), 28.5, 29, 28.5. Cb1, arjuna, meet M at G cafe & we are early enough to get a mozz baguette. Then strawberry fair: excellent. Wander for an hour with M, then she goes off & I spend another 2ish hours. Day hot/sultry. Buy nepalese paper for diaries/photos, a 'cat in the hat' ish hat for D which he likes, a possible box for the portable (well made of wood covered in beer cans, & papered inside with pluto cartoons in fr). M+J back from Ely. D tired. Slightly null day, or better said relaxing. Lie-in, then we all read papers in sun.. Lunch plough (walk there by scenic route: footpath through churchyard): quite good (except M's, which was also late. Waitresses cheerful but not fully competent) & the beer was good. However the resto atmosphere is uninspired. D tired & put to bed at 4 but too excited to sleep so comes down again. But too tired to behave well. Also we're all tired: M'd & I both have a snooze. M+J leave at 5ish taking D's car seat, tunnel & tent for france. Allot: leave D with M & go to plant beans. I have lost my bag of shallot sets - & my nice thornproof gloves. Back: put 2x courgettes into garden. Sealion most of day. Good talk to dc. Afterwards: first try climat -> oracle: I'm rusty on this. But get there. Swim 2x20 in 29.5, 31.5. Not good. Its some time since I've done 20's. Could have left w'loo 1 hour later but thats a bit tight across Paris + we save £20 + we have time for a coffee with Si+B. To ul, in the next step on my mystical quest for fourier 1827 on the g/h effect. Book is on order so I wait in the tearoom which is charmless but otherwise acceptable. Photocopying has to be done by staff at a several day delay. The idea that I might photograph the book myself is greeted with horror. Back from coffee I skim M. Fourier, who is surprisingly readable, but cannot find any ref to gh. But I only have 1/4 hour over 30 pages. Submit photocopying job & home. Play with D till 4. He is unhappy at thunder & wants to be cuddled & seems tired & volunteers bed, where he sleeps 2h. Meanwhile I put up rose trellis in front, & make hole for pond fountain wire in shed & thread it through. Soir: M cooks aubergine & courgette bake with yoghurt/feta topping, while I garden: tidy up the front (mostly, pull up mares tails) & prune the pink bush & bring some flowers in. Work. Bas is experimenting with a flavia-type machine to provide morning coffee. So of course the queues are enormous - 1 is far too slow. Plus they seem to have good for an el-cheapo version that produces e-c coffee. Why does D say 'da!' to birds? But why do adults say boo? D has discovered the insectide sprayer (which I haven't used) ma gave me for the new rose & now delights in squirting things. He knows how to pump it up himself. To lammas land. On the way stop at izza nozza to confer on pub with A. New building work quite impressive - grass roofs, no less. Other bits are odd - 'watchtowers' that seem to be assoc with heating sys. D can now get over the top of the climbing A-frame by himself. He plays in the paddling pool for a long time & 1/2 talks to some other kids. But then, while balancing on 2 hands & one leg he falls forward & bashes his face on the concrete :-( However he doesn't want to go home immeadiately so we play at little more. At home we put on tcp lotion (which I keep mis-saying as tcp-ip lotion) & plasters, but at D's insistence only little ones. Pleasant, long & quiet lunch with M in Fr cafe. Look at luggage in rs & then we part: I to arjuna/cb1. Then to ul to get M. F but their rare photocopier is bust so content self with Jones '90 & Wood '09. Allotment: tidy till I'm tired (about 8.30) & plant 3 dahlias. Home: type in Wood, despite windoze best efforts to stop me. Walking back from M'a I teach D about snails: how they go back into their shells if you tap them. I left my keys inside home. Oops. Arrange to meet M at w's to pick up hers. Wait in shed while it rains steadily for 20 mins. D gets bored & goes to play in car. Then he decides he wants to go into the house & before I can explain that this is not possible he pushes on the back door... which opens. Argh (burglars note: we don't do this often). Go in & get keys &, since it is still raining, drive to p+r. Meet M in street so go to w'stones new old cafe, which is better than the new cafe & may be better than the old, too. D 'reads' Rogers Profanisaurus & laughs. Bus back then to orchard (for a tomato) - currently trapped in room of fountains. Get 4 toms: shirley, beefsteak, moneymaker & x & plant them out - can test & see which does best. Soir: 22 c'ton: Kirsty is b'sitting with M'a's help. From grauniad: "doming down: the process by which a public venture is rendered incoherent & pointless in an attempt to appeal to the widest possible audience". DAT & PSH are due today. I sneak out early for a swim (2x20 in 30), cb1 then a quick round of arjuna, cheese shop, fr cafe shop & health food shop (for g+b's ice cream). Back to help tidy (mostly done y'day pre K&M'a) & take D off M's hands so she can get cooking started. Just about to start sweeping patio when saved by Psh arriving. They have a gleaming new bmw, the product of the Smiths company car scheme. H is quiet, looking about her, & v dark-eyed & cute. Lunch: M does baked cougettes with yog/halloumi. After ps want to walk Helen so I take them as far as village turn. They go on to orchard - I return to washing up. D sleeps. Dat arrive (with T initially asleep) & we exclaim over relative car cleanliness. A is well preggers & looks well. All sit around for tea/coffee that lasts for rest of day. Initial quiet with only one child awake. Impress pd with Graviton on palm. Show da the pond & a newt obliges as well as a few frogs. 'The world is lovely' volunteers D. And indeed we seem to be in an eternal spring, the garden v green & beautiful in a wild way, maintained by recent thunderstorms. This morning sun but not too warm. D can say (but not sing) all 'come little rabbit stay with me'. Put up some more wires for grapevine & passionflower vine - which has started to form flowers. Decide to go to cafe in town & stop on the way at bridge to watch punts & realise: why not? So go punting - certainly first time in cambridge. Initially try from front but swiftly go to back. Discover the pool by the grad pad & the slope, so off side channel to granta pool, then under low bridge (M+D duck, I go over) down tiny channel with cows that soon dead-ends. Return: M punts. To fr cafe for crepes. Then I leave them for w's & we exchange after an hour. ...and came down: back to lammas land. Climbing frame (asks for help at top but doesn't need it: is pleased to get over by self) r'about, horse, big slide & now p'pool. Chase D giggling round pool (him not me). Soir: windoze & clik have a fight which w resolves in characteristic fashion by sulking: ie reboots. Many times. It even distinguishes itself by dying in scandisk... In the meantime, get though the tricky 5th (and last of unreg version) level of g'ton. Last week pre-hols. Wander garden with a hoe but most is in order. Good. D can turn on o'side tap but does it too hard & gets soaked. To playgr - he runs off happily. Pick him up from M'a. Play in garden & are down at end looking for little pond when M comes back, graceful in the evening light & green shade. She makes kedgeree & off to Y as ever. I have more compute frustrations: I need a 2.14 kernel to make clik under linux & I have 2.12. But: get pcmcia modem working again under wvdial. Download w'end piccies for phil & den. M has dentists at 8.30 so D leaves early, so I have tea & leave late. 2x20 in 29.25 & 30. Long time in cb1 (*when* will they get proper cakes again?). Various burble near G centre, then ul where F 1827 has been copied for me. Excellent. Home via allotment: pick rhubarb & strawberries!. Photo F (settle on cameras vga res, most pages are ok on low but some that were poorly copied need fine). Do D too, since he insists. D has learnt the awful words 'but Mummy lets me do it', it in this case being putting washing powder into the machine. Spend ages looking for palm pen, even tidying up, & eventually discover I've washed it. Seems ok! Beat down cow parsley near shed in hopes of finding an eucalyptus but find an oak instead. A fair swap. M: are you taking that chomsky book on hols? I may take my philosophy book... they're sort of similar... well they both make you think. Me: well clearly not v hard. To be fair she had just gone back to spend all evening at work. Read F. No gh that I can see. We all have nit shampoo in our hair at M's instigation. pm: D should really be put to bed but I am too gentle in the face of his entreaties, so he stays up but tired. Later on (at D's request) to j+k for a little visit. Soir: to village hall for rec pavillion meeting. Kathy Raven proposes buying land near school which is more central instead. Cricket club chap says a pavillion they saw elsewhere cost £65k (but sadly failed to get details). KR proposes the self-build option but in an unconvincing way. Laws says lottery too expensive: should do without. Thorne says so by letter. Some question re # of people who would benefit, given cost. Trustees veto self-build - get new trustees ;-(? Rec is in 'wrong place'? . Sally: no shade at rec . Nothing will ever happen unless someone competent starts to lead this. 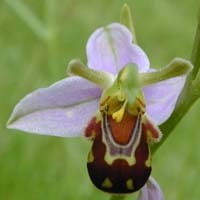 Lunch fr cafe: I'm late: photoing bee orchids. Coop for fr money then cb1. Hot but unsunny. Allot: tidy & pick rasp & straw. Home: do bees! End up taking out 5 1/2 pounds of comb built not-on-frames. Go away & make 3 more frames then put those in. Drain honey & jar it up. Before opening the hive I had geared up & cut back the path down to the stream. This had irritated a few bees, so I had assumed they were in a bad mood. So when I opened the hive I was in-a-hurry mode. This was silly because it soon became clear that the bees were actually being mild (despite honey spilt in haste). But because my mindset was hurry-no-time-to-think I didn't reevaluate. Sadly this lead to unnecessary bee deaths as I didn't stop to brush the comb before dumping the comb in a bowl. Killing bees like that - even if its only a few of many - feels unaesthetic. Garden until late - 9.30 ish. Mow lawns front & back. Plant out remaining plants: runners, dahlias, last courgette. Shower. Tea & food over news then start packing about 10.30 (after going out to slug-pick but they were mostly eating the grass clippings) & finish (argh) about 1. Where has the rest of the month gone? See Lescun: the special holiday supplement.